​ Sealaska Heritage Institute (SHI) has released two new interactive games on its “Tlingit Language Games” app and added quizzes and score tracking to it and to its “Learning Tlingit” app. “Ax Hídi” (My House) is a new game for mobile devices that teaches more than seventy Tlingit words for items commonly found in a home. The game starts outside the house and players meander through rooms, including a living room, a dining room, a bedroom, a closet, a kitchen, a dining room and a pantry. As they click on items, such as a fireplace and shoes, the Tlingit and English words appear and the Tlingit audio plays. SHI also added the new game “Move the Murrelet,” which teaches positional phrases in Tlingit. As the user moves a murrelet around a boat, the bird’s position appears onscreen and the Tlingit audio of the phrase plays. For example, if the user clicks under the boat, the murrelet appears in that position and the English and Tlingit text “The murrelet is under the boat” appears and the Tlingit audio plays. Both games include quizzes and a new feature to allow players to track their highest scores. SHI also added a quiz feature and score tracking component to its “Learning Tlingit” app, which was released last year and contains hundreds of entries in more than twenty categories. The app now has a quiz within each category and statistical tracking for time spent in each category and highest score. SHI has found interactive tools to be especially effective in teaching Native languages because they associate words and phrases with audio and sometimes images, which helps students retain the language, said SHI President Rosita Worl. SHI also has found with previous interactive tools for desktop computers that the quizzes are an important component, Worl said. It’s also important to keep up with technology and students want to learn through their mobile devices these days, she said. The new games include Tlingit audio by Johnny Marks and Tlingit text edited by Marks and Keri (Edwards) Eggleston and Katrina Hotch, who also edited the audio. 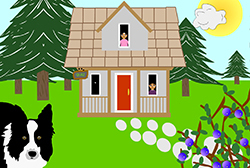 The “My House” graphics and original interactive game were produced by Kathy Dye and the “Move the Murrelet” graphics and original interactive game were produced by Rico Worl. Desktop versions of the games are available in the language resources section at www.sealaskaheritage.org.